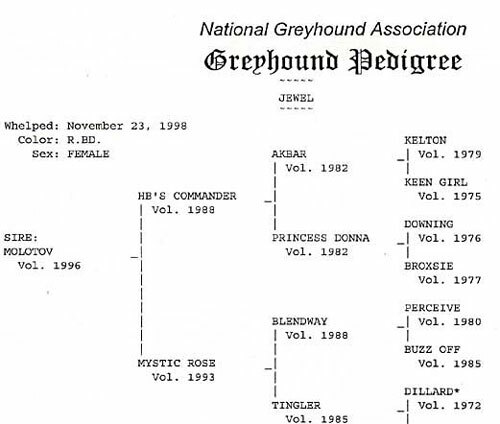 The National Greyhound Association Greyhound Pedigree is an official document of the NGA, signed by the Keeper of the Stud Book. The pedigree goes back five generations and lists the volume number and year the ancestors were registered with NGA. This Pedigree is on 25 percent cotton 8-1/2 x 11 recycled paper and suitable for framing. View a sample of a full pedigree or an upclose sample of a pedigree.